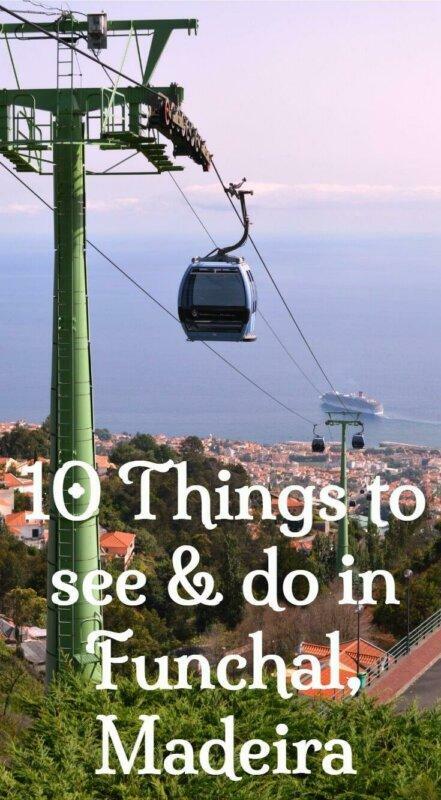 You’ll find there are plenty of things to do in Funchal, Madeira Island’s capital city. Some of the city’s most worthwhile attractions are way above sea level and best reached by cable car but the journey is part of the fun. 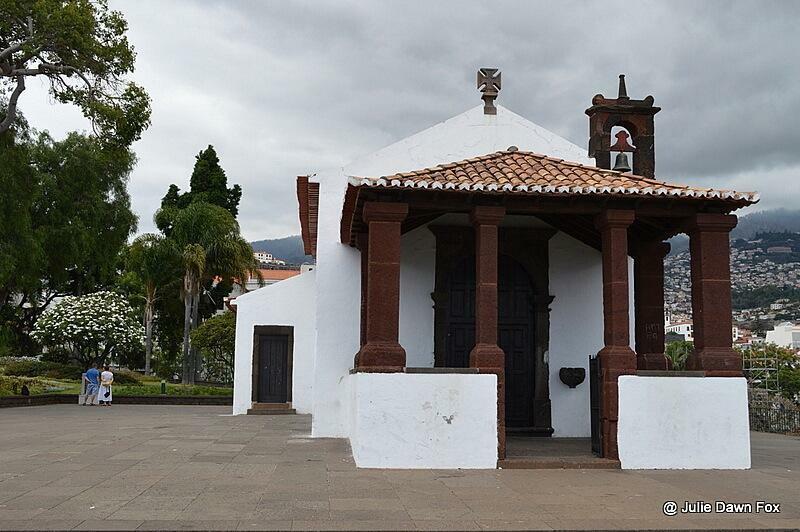 Thankfully, old town Funchal is relatively flat and easy to explore on foot. Just try not to twist your ankle on your first day, like I did. In no particular order, here are some of the highlights of Funchal that Mike and I discovered during our trip to Madeira, plus some practical travel tips for getting around. Our first venture into the centre of Funchal took us to the harbour. Cruise ships dock here but we arrived just in time to watch passengers embarking the Santa Maria, a replica of Christopher Columbus’ 15th century ship, and being greeted by a costumed sailor complete with parrot. We considered boarding as stowaways but simply didn’t have time for the 3-hour voyage. 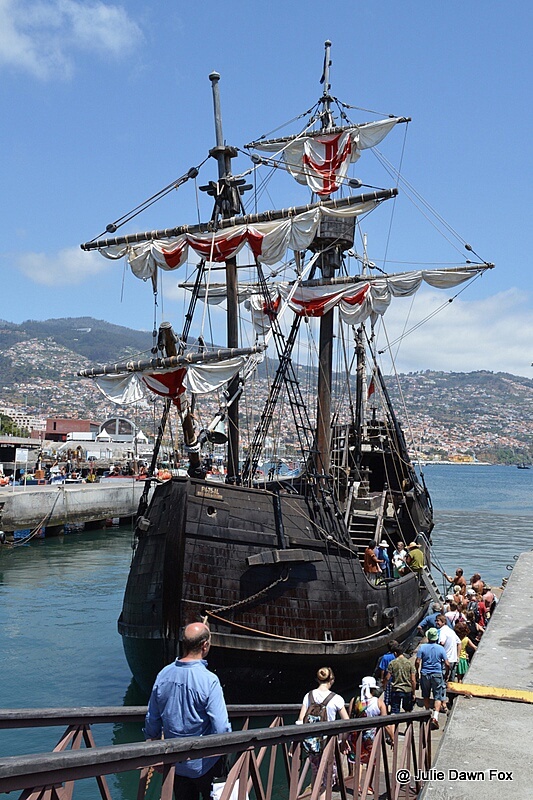 You can book this popular Funchal boat tour online. If the historical and theatrical nature of this sailing trip doesn’t appeal, you’ll find plenty of other boat and catamaran tours leaving from the marina, just a little further on from the harbour. Funchal harbour is also used by local fishermen, as evidenced by piles of nets and the squawking of excited seagulls watching a catch being unloaded. We paused to observe the process as ice pumped from the next-door factory along a chute and into the same sacks that the fish were being shovelled into. From the harbour, it’s a pleasant stroll along the seafront, past the Santa Catarina gardens (see #10), to the marina where you’ll find several cafés and restaurants. Tip: If you’re walking into old town Funchal from your hotel, make sure you avoid tunnels. I know from experience that they aren’t pleasant to walk through! 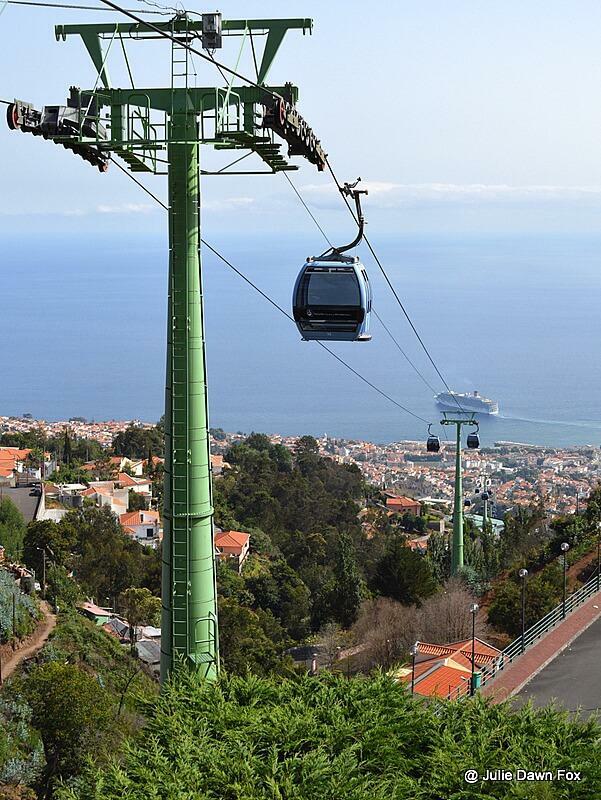 If you’d rather get around by sightseeing bus, there is a hop-on-hop-off service in Funchal with a choice of two routes to take you to the city’s most important locations and viewpoints. As I mentioned in my post about food and drink in Madeira, the Mercado dos Lavradores (Workers’ Market) is a feast for the senses. Flowers, fruit, vegetables and souvenirs are beautifully displayed in an attractive space full of atmosphere. Look out for the display cabinet with vintage scales on the upper floor and if you’ve got time, take advantage of the café on the terrace. 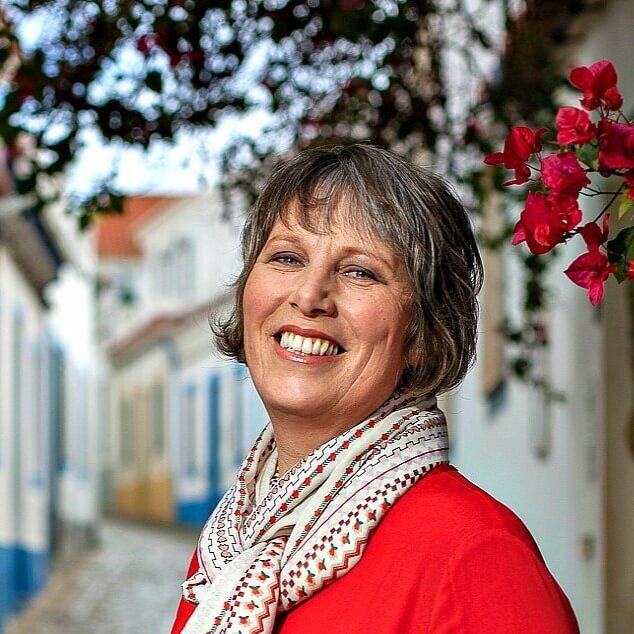 If you’d like to get a more in depth understanding of local food and wine, you can visit the market as part of a 3-hour food and wine walking tour of Funchal. Tip: By all means sample the glorious varieties of local fruit but if you do decide to buy, haggle hard. You can often find the same fruit in supermarkets at a fraction of the cost. 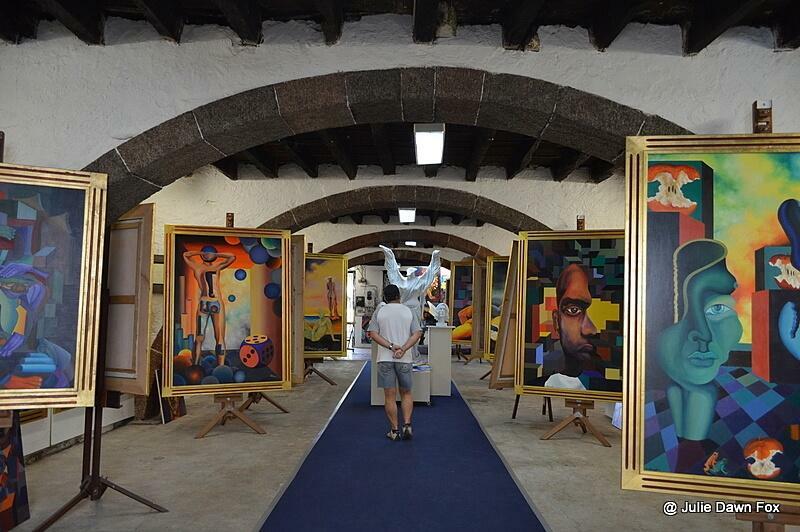 Funchal’s artE pORtas abErtas project began in 2010 and breathed new life into the historical centre of the city by turning disused doorways into works of art. These days, almost every other door in Rua de Santa Maria is testament to the creativity of local artists. If the profusion of trendy bars and restaurants is anything to go by, the urban art project has succeeded in drawing more visitors into the ancient streets. I, for one, loved it and have the photos to prove it. I’ll limit myself to sharing my favourites with you here. If you only have time for one set of gardens, make it the ones at Monte Palace (open daily from 9.30 to 6 pm, accessible by cable car – see #5). You will, however, need about half a day to do them justice. In fact, if you only have time for one experience in Funchal, I’d recommend coming here. Scattered among the tropical foliage and blossoms, you’ll find all manner of artworks including azulejo (painted tile) panels depicting the history of Portugal in colourful bite-sized chunks, decorative ceramics and a panoply of sculptures thanks to the Berardo Foundation. The museum (open from 10 am to 4.30 pm) is devoted to a collection of African stone sculptures and the most magnificent collection of minerals I have ever seen. Tip: When you get to the Koi pond, look for the underwater viewing panel. Monte is Portuguese for Mount so unsurprisingly, this part of the city is high above sea level. It’s possible to catch a bus uphill (or down) but the cable car makes for a far more thrilling journey. As you rise above Funchal, you’ll get voyeuristic glimpses into private gardens and dramatic views down through steep gorges. The 3,200-metre ride itself takes 15-20 minutes and is both relaxing and thrilling at the same time. Tip: Buy a return ticket to save money. It’s 11 euros to go one way or 16 return. More info here. Tip: If you want to come downhill in a basket instead, note that these toboggan rides don’t go all the way to the bottom of the hill and the waiting taxi drivers are in the habit of ripping tourists off. Insist on them using the meter – the taxi journey should cost around €8-€10 euros. As we wandered through the open air art gallery of painted doors in the historical centre, we stumbled across Clube dos Poetas e Artistas. The works of several local and national artists are housed over several floors of a crumbling old building and are available to buy as originals or prints. Styles and degree of artistic talent vary but there are some real treats inside, such as the tropical paradise paintings by Ricardo Andrade, a print of which is now on my office wall. Tip: Don’t miss the outer stairwell – when I visited, it was decorated with murals and giant red metal sculptures. 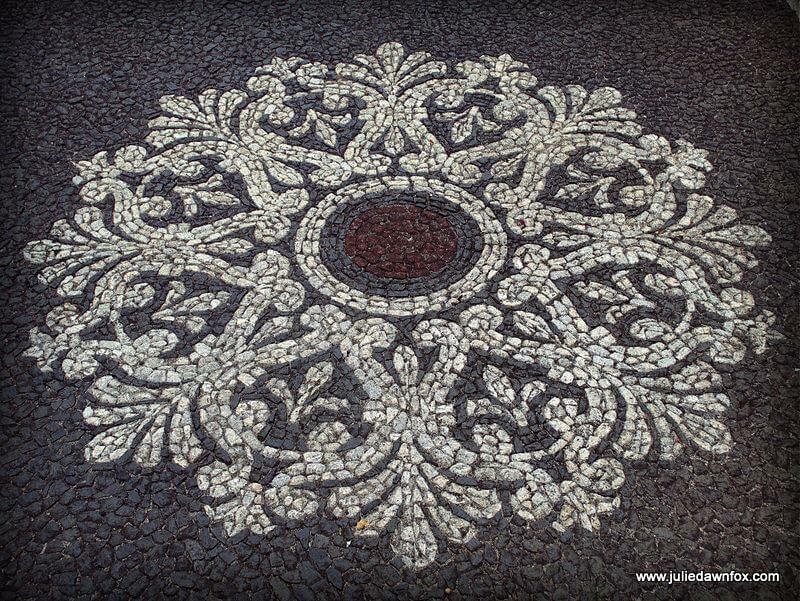 One of Portugal’s precious features is its calçada (patterned mosaic pavements). On the mainland, the designs are usually picked out in black basalt and white limestone but in Madeira, the local volcanic stone is used. Not only are the stones, and therefore the colours, different in Funchal, I was delighted to see a variety of new patterns. This is my absolute favourite and can be found at #8 below. We were lured through the gates of the Universo de Memórias by the promise of tea and scones in the garden tea house, not realising that the house itself is packed with treasures. We didn’t have time for both refreshments and a visit before the museum closed so we opted for the guided tour. It was the right decision, although my advice would be to allow time for both if you can (open Monday to Friday from 10 am to 5 pm, guided visited every 30 minutes, 3.50 euros). The 19th century house is charming with its stained glass windows and original ceramic and inlaid wooden floors. The architectural features are, however, completely overshadowed by the myriad of paintings, ornaments and oddities that cover every other surface. Each item is part of a collection built by João Carlos Abreu, Madeira’s former Minister of Tourism and Culture. There’s far too much to take in during a single 30-minute visit and photos aren’t allowed inside. I can still call to mind a couple of the horses from the room dedicated to his 600-piece collection of horse sculptures and paintings. I couldn’t get the virtual tour to work but if you hover over the floor plans on this webpage, you’ll get a glimpse of what’s in each room. 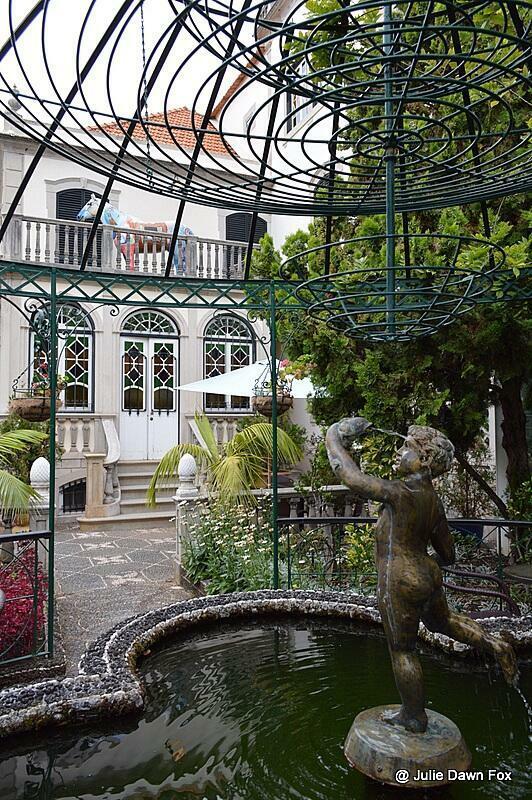 It seems fitting that the last residence of João Gonçalves Zarco, the man who discovered Madeira, should now be a museum. The typical Madeiran quinta (estate) contains period furniture and ornaments as well as a collection of silverware and ceramics. I found the black and white photographic exhibition to be more interesting than most of the first floor exhibits. The images provide an interesting glimpse into aristocratic life on the early 20th century as well as local industries. If you’re short on time, you could skip the museum and stroll around the pretty gardens instead. 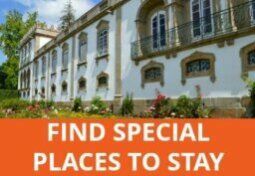 Or take a tuk tuk tour of Funchal’s historical centre which includes entrance at Quinta das Cruzes. If you don’t have time to go to Monte but still fancy some greenery, the city centre Santa Catarina park is a soothing place for escaping the bustle and enjoying the ocean views. From the café, you’ll see distant green mountains surrounding the city beyond the central pond with its fountains and swans. There’s also a children’s playground if you need one and a cute little chapel. Best of all, it costs nothing to enter unlike many of Funchal’s other gardens. If you take the airport bus into Funchal, ask for a timetable (on board or at the tourist information centre) so you can work out whether or not you should buy a return ticket (5 euros 1 way, 8 euros return). 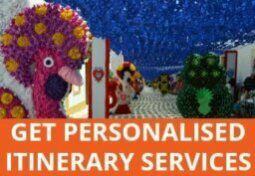 Alternatively, you can book a shared airport transfer in advance. Before leaving the airport, pop into the tourist information office to pick up a map of Madeira and Funchal as well as the leaflet with bus stop information. If you plan to use the bus in or around Funchal, use Horários do Funchal (available online or as a free app) to find bus routes and times. Buy a rechargeable Giro card as soon as possible from the marina area and load it with trips for urban travel. This is considerably cheaper than paying for tickets on board. Disclosure: This article contains affiliate links, which simply means that at no extra cost to you I may receive a small commission when you book using my link. Thanks for this article and all those useful tips, I’m saving it for later. I can’t wait for my trip to Madeira in February! 🙂 I just hope the weather will be good for hiking and I’m also planning to visit a few tropical gardens. These paintings on the door look incredible! Thanks for sharing it, I would have missed it as my book guide didn’t mention that! Happy to hear that. I’ll keep my fingers crossed for good weather for you. Yes, although you should always double check key information such as opening times and prices as things may change between updates. Loved the article ! It really helped me out planning my next trip! Our cruise ship arrives on a Sunday – would everything still be open ??? And what about getting a ride in a lovely Rolls Royce or Chevrolet Phaeton?!? PS beware of the swans in the Monte Palace Gardens – Diana was quite unprovokedly attacked and bitten by one! Oh dear! Well we managed to escape unscathed but they can be quite vicious at times. I hope she wasn’t badly injured. Re the cable cars – I would really recommend taking the bus (or a taxi – not too expensive) to the Botanic Gardens, which are well worth a visit in their own right, and taking the other cable car from there to Monte – it’s quite different as it swings over a wild and lush ravine, unlike the better-known one which goes over roofs! From the top it’s just a few minutes walk (more or less flat) to the Monte Palace Gardens and the Monte – Town cable car. And as far as I can remember there’s a combined ticket which lets you do this, too. I’ve never fancied the toboggan – although apparently Hemingway, no less, found it really exciting. Thanks for the great tip, Robert. I should have asked you before we went! never mind, it’s yet another reason to go back for more. I had read some less than glowing reports about the botanical gardens and decided not to bother but if you think they’re worth a trip, I’ll give them a go. You and Susanna have managed to convince me. I think it’s about 20 euros for 1 person and 30 for 2.
instead of going back own with the cable try the wooden sleds an experience to remember ! Thanks for telling me this, Susanna. 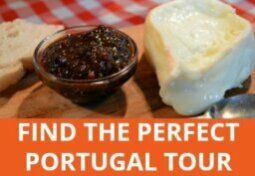 Between you and Jan, I’ve been persuaded to give it a go next time I’m in Funchal.